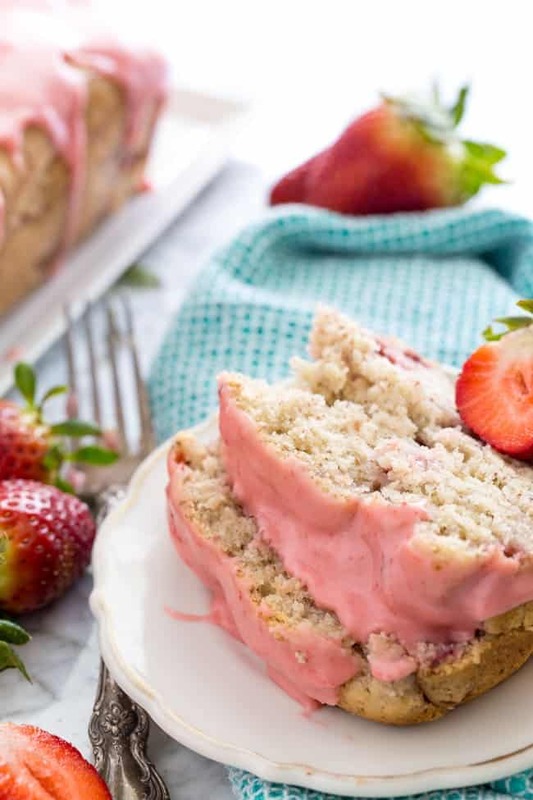 This light and fluffy cake is jam-packed with fresh strawberries in every single bite, making this the perfectly sweet addition to any special occasion. So I think I’m on a kick. First there were Chocolate Coffee Cheesecake Strawberries on Valentine’s Day. And then we celebrated my blogiversary with Chocolate Covered Strawberry Cupcakes. 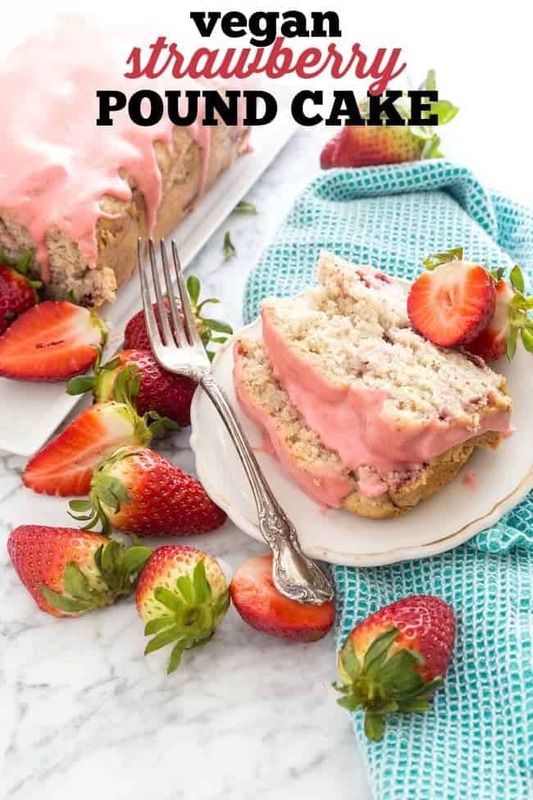 And now, well, as you can see, I’ve brought you this beautiful Strawberry Pound Cake. The only thing missing is chocolate, it seems. My little family just loves strawberries. It is one of the few fruits I actually like, as I’m more of a veggie lover than a fruit lover. And my son has been eating them since he was a baby. Anyway… so we love strawberries so much. As soon as they started leaving the shelves toward the end of last summer and into the fall, I swear my kiddo begged for them even more than normal. I had to explain to him that they weren’t in season during the fall and winter months and that they wouldn’t taste quite as good. And also, that you would have to pay about a thousand dollars just for a handful of sour strawberries. Not cool! So the other day when I laid out all the ingredients for this perfect pound cake, I had my little helper right by my side just waiting to snag a freshly washed strawberry. As soon as I turned my head to crack an egg into a bowl, I heard a, “yuuum! Strawberries are FINALLY in season!” from my little 6 year old guy. He was so excited to be experiencing a truly sweet in-season strawberry. The first good one of the season. So sweet to experience cute things like that through my Xander. This cake wasn’t originally spotted with strawberries. 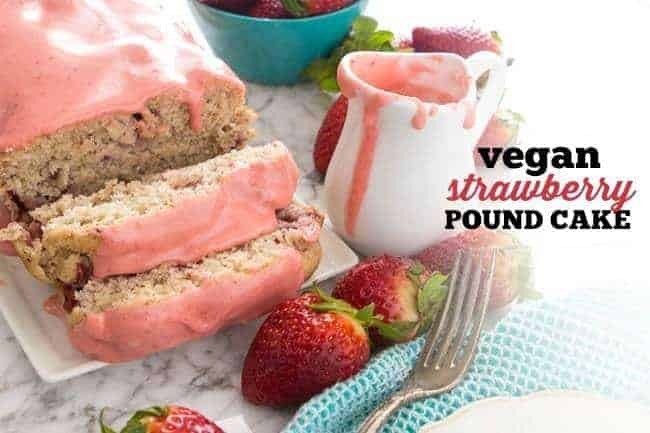 But oh, it was totally meant to be made with strawberries. 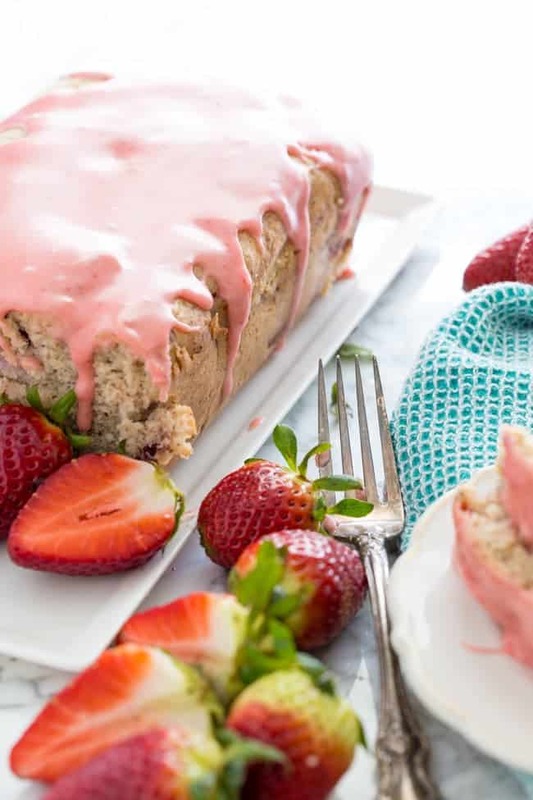 As I was flipping through my “A World of Cake” cookbook, I came across a beautiful cranberry pound cake that I just had to try out, and I knew strawberries would make a perfect substitution here. I sure do love me some loaf cakes and breads. There was the Glazed Lemon Blueberry Loaf, and of course my Coconut Lime Banana Bread. One little slice just seems so perfect for a mid-afternoon treat. It’s not like cutting a slice of a layer cake and feeling like you’re eating a piece of birthday cake. The texture of this pound cake is so light, fluffy, and moist (again, I hate that word, but it really is!). On top of that, the glaze is just out of this world. 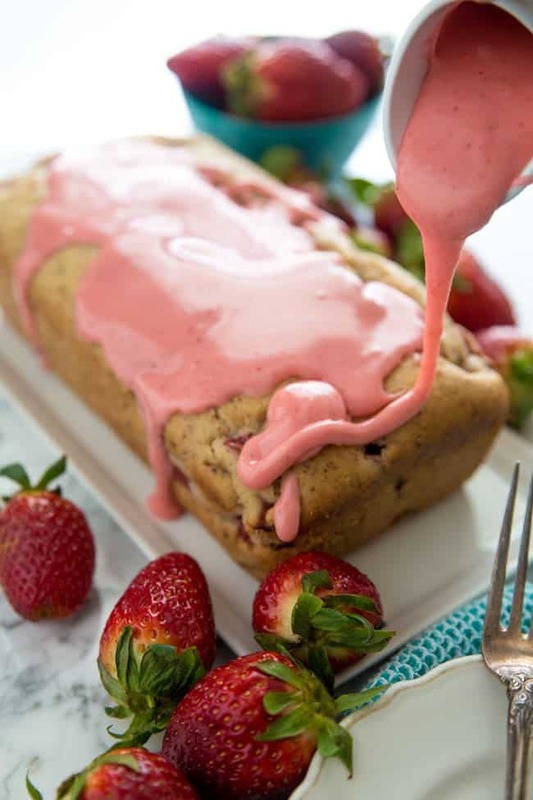 The original recipe suggested using a fruit juice to flavor your glaze, but I thought I’d take one little extra step and make a strawberry puree to make things much more fresh and natural. Nothing better than fresh ingredients, especially when they are finally in season! 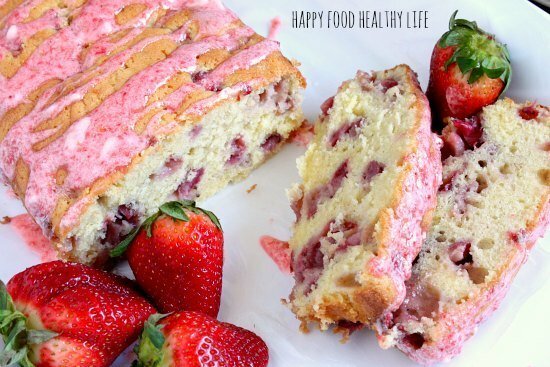 Strawberry Pound Cake gets a healthier makeover in this recipe! Prepare flax egg and let sit for 5 minutes until goopy, like egg whites. Cream together the butter and sugar, mixing in vanilla and the flax egg once that's ready. In a medium bowl, combine flour, salt, and baking powder. Gradually add the flour mixture to the wet ingredients and blend well. In the bowl of a stand mixer with the whisk attachment, whisk the aquafaba on high for about 10-15 minutes, or until you have achieved stiff peaks. Delicately fold first the aquafaba fluff and then the strawberries into the batter, until blended. Pour the batter into the prepared pan and bake for 50-60 minutes, until a toothpick inserted in the center comes out clean. Leave in the pan to cool. Once cool, invert onto serving plate. To make strawberry puree, put 1-2 strawberries in a food processor and pulse until smooth. Add puree to powdered sugar, just 1 tsp at a time until the glaze reaches the desired consistency. Drizzle glaze over top of cooled cake. I really want to try this recipe, it looks amazing! I love your site, thanks for sharing. Check us out sometime, if you get a chance! thank you so much for coming by! I really hope you get a chance to try it out! I’m sure your family would gobble it up just like mine has! Is strawberry puree something you buy or that you make? I made the puree by throwing about 6-7 strawberries in my food processor and blending until smooth. 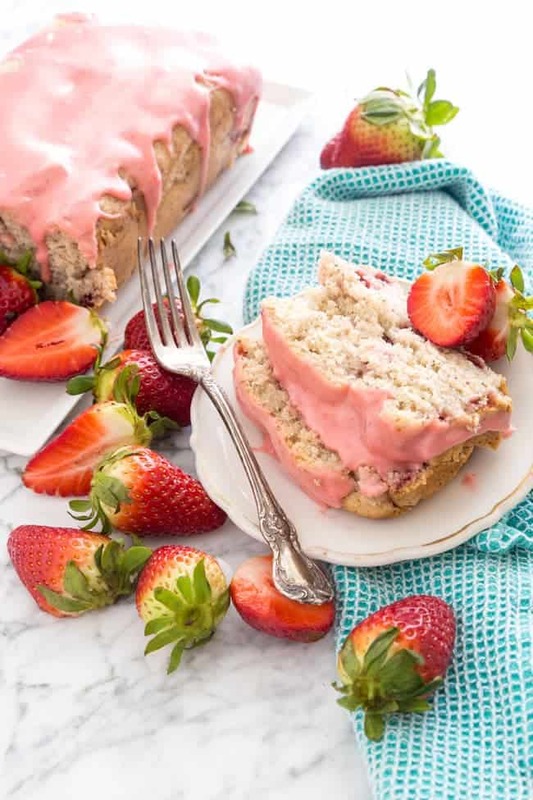 Wow, this strawberry pound cake looks so delicious! 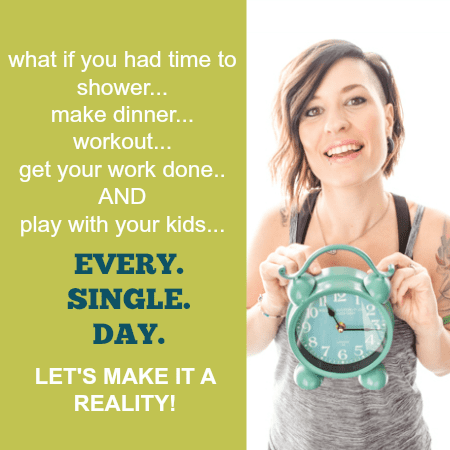 I’d love for you to link up a few yummy recipes at my weekend link party@The Weekend re-Treat! on The Best Blog Recipes if you haven’t already! Thanks for letting me know about your party! I just arrived fashionably late and mingled a bit 🙂 Thanks for coming by! OH I just bought some strawberries this looks so good I can’t wait to try it! I just bought another 5lb of them, and I’m seriously considering making another one of these, it was so good! Thank you! I hope you do try it out! I think I need a huge slice of this and a nice cup o’joe! You really should whip this cake up and have it ready for morning… it’s SO worth it! Great to have you Krista! I appreciate the follow and hope you try the recipe out! Thank you for coming by Lauren! I have no doubt that anyone in your family would love this recipe! This looks so yummy. 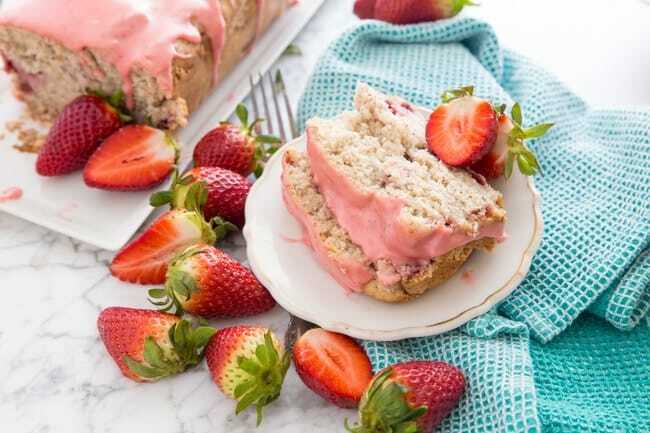 Since strawberries are so plentiful right now, I’ll have to make this soon! I’m visiting from 36th Avenue link party. You’re right, strawberries are everywhere and at good prices too! Thanks for coming by! I pinned this!! So delicious! 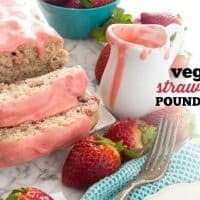 🙂 My kids are HUGE strawberry lovers and we will definitely be trying this! This pound cake is so pretty! Thanks for linking up to Two Cup Tuesday at Pint Sized Baker. I’ve pinned this for later. Thanks Karyn! I’m happy you enjoyed it! I made this yesterday and it was really yummy! However, the glaze did not turn out right for some reason. The powdered sugar never creamed right with the butter, and the butter was softened. It still tasted good but it looked funky because of the powdered sugar. I’m so glad you enjoyed the cake! As for the glaze, that’s really strange :/ I didn’t have to sift the powdered sugar, but I wonder if that would help for you. I have a yummy white chocolate pound cake recipe that is requested all of the time!! I finally was sick of the same old thing. I took your glaze and warmed it a bit and served with grilled pound cake! It is delicious something as simple as taking the fresh strawberries and blending them adding a dash of butter and sugar who knew! I searched everywhere and found yours tasted the best! And yes this was made in winter and it was still yummy! Thank you so much! Your white chocolate pound cake sounds amazing. And with that glaze?! YUM-O! HOW MUCH BAKING POWDER R U SUPPOSE TO PUT IN THIS RECIPE ??????? Anastasia, traditional pound cake does not require baking powder.